In the my previous post about how to setup a Halloween light show, the specialized light controller and PC were introduced. In this entry, we’ll talk about the technological glue that brings those two together, and that is software. There are two pieces of software you’ll need when creating your display, known as a sequencer and a scheduler. A holiday light show is just a sequence of instructions sent to a light controller that time light displays with music. 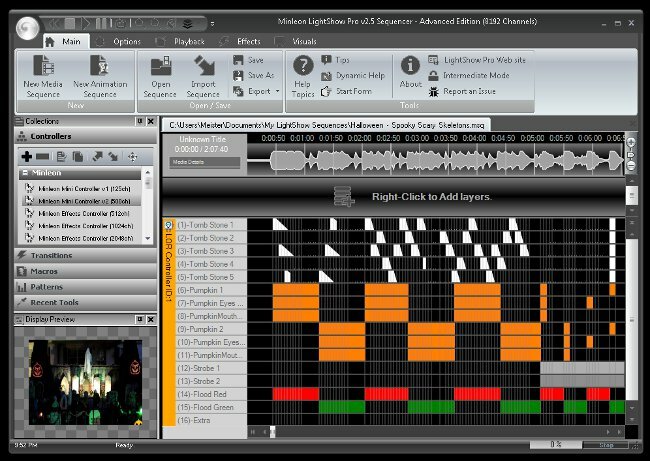 There are a number of different free and paid software suites available that include a sequence creation tool. For this year’s show, I am using the sequencer included with the LightShow Pro software suite. This software makes the task of creating a show easier by showing a visual display of the music that helps you created slices of time within the show that you essentially “paint” with various lighting effects using the different light setups you have for your display. Making your lights turn on, off, shimmer or flash at just the right moments in your show can take a few hours of work, even for a 5 minute sequence. For those who don’t have the time to craft elaborate shows on their own, there are collections of pre-made sequences available through groups that share their creations, as well as professional sites that provide light show equipment. Once you have your collection of sequences and music, you’ll want to setup a playlist to entertain your holiday guests. 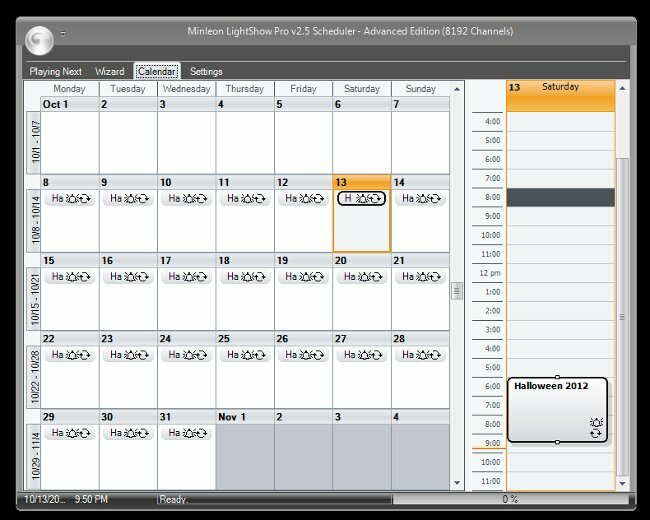 Scheduler software allows you to place your work on a calendar and repeat shows as often as you wish. Many scheduler tools will allow you to setup more advanced options, such as having the current sequence selection automatically posted to a Twitter account, and even upload webcam footage of the current show. If your software is properly setup, you shouldn’t need to access the PC while the show is running. As a geek, I like to be able to connect and troubleshoot any issues with the show without having to drag a monitor, keyboard and mouse to the outdoor box housing my controller and PC. Instead, I use the Remote Desktop Connection tools built into Microsoft Windows to connect across the network via my home PC. I have also installed a software tool that works with the Splashtop app that is available for both iOS and Android. This allows me full access to view and control the PC using my tablet anywhere that has access to the Internet. In my case, when I am standing outside and realize that I’d like to rearrange a sequence or two on the fly.